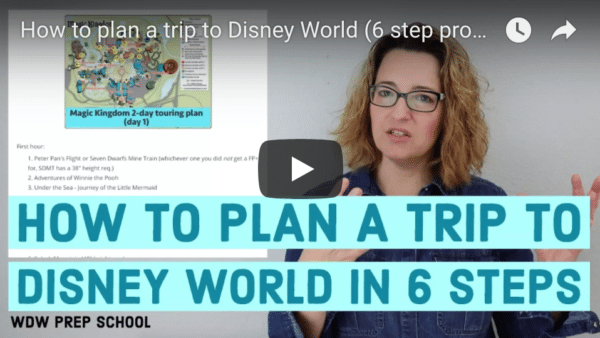 Planning to visit Disney World sometime in 2019 and worried about crowds? If you choose your dates wisely, you can avoid peak crowd times and make your trip much easier. 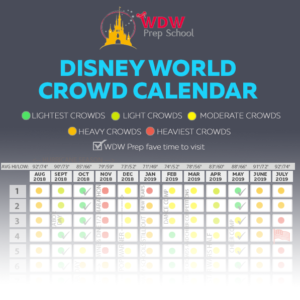 To help you do that, we've got a Disney World crowd calendar of predicted crowds based on school calendars of many of the biggest districts, holidays, runDisney races, ticket prices, and years of experience being in the parks at all times of the year. As you can imagine, anytime something major opens or something popular closes the crowds in the parks are heavily impacted. In 2019 there are several attractions and nighttime shows that are doing just that. In general, the parks where the attraction or show is located will see the largest impact, but it isn't unusual for all the parks to see a temporary surge in crowds. And, with Star Wars: Galaxy's Edge being one of the most highly anticipated additions to Disney World we've ever seen there isn't a lot of historical data to use when compiling predictions. But, one thing we do know is that lots of people have been delaying their trips in order to catch the new Star Wars attractions and that means that once open Hollywood Studios will likely be very busy for months after the opening and the entire Disney World Resort area will be busier than years past. Crowd levels are fluid from year to year. What was considered "moderate" in years past is not the same thing that is considered "moderate" now; it is simply "moderate" when compared to the rest of the year (going forward). We saw a dramatic increase in the crowds in the final days of Wishes at Magic Kingdom and while we don't think we will see the same level of increase in the crowds for the end of Illuminations and the beginning of Epcot Forever (a temporary show that will run until the replacement for Illuminations is completed in 2020) you should still plan for higher-than-anticipated crowds if traveling during that time. Disney has announced that this highly anticipated land will open in 2 phases. Phase 1 will include the opening of Millennium Falcon: Smugglers Run, however, the 2nd attraction in that area (Rise of the Resistance) won't open until later in the year. Based on the known opening date we have adjusted our predictions below. In addition, once announced there is a chance we will need to adjust the crowd level predictions for the dates surrounding the opening of Rise of Resistance as crowds are likely to return to check out that new attraction. Check our guide to Star Wars at Disney World to keep up with the progress. January 19-21 - a 3-day weekend due to Martin Luther King Day. Many people go to Disney World during this time expecting light crowds, but it's actually a very busy time to be there. Find out which parks are recommended each day (plus lots more info) on the January crowd calendar. The handpicked team of agents at Prep School Travel can help you out. Fill out the info below to get started. Find out which parks are recommended each day (plus lots more info) on the February crowd calendar. Find out which parks are recommended each day (plus lots more info) on the March crowd calendar. Find out which parks are recommended each day (plus lots more info) on the April crowd calendar. Find out which parks are recommended each day (plus lots more info) on the May crowd calendar. Find out which parks are recommended each day (plus lots more info) on the June crowd calendar. Find out which parks are recommended each day (plus lots more info) on the July crowd calendar. With the announcement of Star Wars: Galaxy's Edge partially opening up this month, expect the crowds to be heavier than expected (especially in Hollywood Studios). As more information is released we may need to adjust the crowd levels indicated below. Find out which parks are recommended each day (plus lots more info) on the August crowd calendar. With the announcement of Star Wars: Galaxy's Edge partially opening up last month, expect the crowds to be heavier than expected (especially in Hollywood Studios). As more information is released we may need to adjust the crowd levels indicated below. Find out which parks are recommended each day (plus lots more info) on the September crowd calendar. While the Food and Wine Festival is going on at Epcot throughout the month of October, it doesn't necessarily create an overall surge in crowd levels at all of Disney World as much as it creates a surge of locals going to Epcot on the weekends. That's why Epcot on the weekends isn't recommended during this time. Hollywood Studios will also likely remain busy as crowds continue to flock to see the new Star Wars: Galaxy's Edge. Find out which parks are recommended each day (plus lots more info) on the October crowd calendar. While the Food and Wine Festival takes place at Epcot for the beginning of November, it doesn't necessarily create an overall surge in crowds at all of Disney World as much as it creates a surge of locals going to Epcot on the weekends. That's why Epcot on the weekends isn't recommended during this time. Hollywood Studios will also likely remain busy as crowds continue to flock to see the new Star Wars: Galaxy's Edge. November 4-7 - many schools in New Jersey have a couple of days off of school this week and families often take advantage and spend part or all of this week at Disney World in what's commonly called "Jersey Week." This time period also sees an influx of crowds remaining from the Wine and Dine Half Marathon. Find out which parks are recommended each day (plus lots more info) on the November crowd calendar. Hollywood Studios will remain busy as crowds continue to flock to see the new Star Wars: Galaxy's Edge. Find out which parks are recommended each day (plus lots more info) on the December crowd calendar. January 17-20 - heavy crowds return with the UCA & UDA College Cheerleading and Dance Team National Championship taking place and the 3-day weekend due to Martin Luther King, Jr. Day. When do you plan to visit? 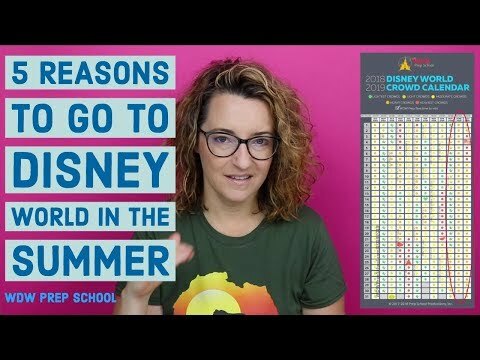 Any questions about our Disney World crowd calendar? Feel free to leave your thoughts in the comments, but please don't ask us to compare to crowd calendars from other sites. We've explained the reasoning behind our calendar here and won't be commenting on how other sites do things. Hi ~ I can’t find the link to the entire 2019-2020 crowd calendar :/ Can you help tell me where to find it… I only see the monthly ones. Thanks ! My son wants to do Disney for graduation present, but we will need to go July 19-27, 2019 (usually go end of August) hoping crowds will be less maybe people will wait till late fall for Star Wars Land opening. One can hope. When will you have a calendar for Oct 2019? I went to Disney the week after Thanksgiving in 2017 and it was crazy busy. 2 to 3 hour waits. Don’t believe that the crowds drop off significantly…they stay very busy sadly. I would say moderate to busy. The crowd will build close to Christmas. Plan on getting there 30 min before park opens and use magic hrs if staying at Disney avoid those parks that day if you stay off property. Especially early in the month the after hrs Christmas is a good time and you avoid daytime crowds. Go early! As others have stated most districts in our state have the last week off in March 2019 off for Spring Break as well. We are booked December 12-18 this year, what c as n we expect for the crowds that week? Just FYI — many districts in Tennessee have March 25-29, 2019 off for Spring Break. I am surprised to see that late March 2019 is LESS busy than early March. This seems the opposite of most years? Check out local high schools for their Senior Weeks. We went during the second week of May 2015 and the kids were well behaved, but lines were longer due to them being there. Hello! I went in May 2017 a day after cheer ended and the following 2 days crowds were heavier; especially the bigger rides. It calmed by the later part of the week. This is the earliest Thanksgiving can be on the calendar. I agree the first week of December usually picks up, you have a full week of November the following week. It makes a big difference. I was looking at May 2019. I can see some cheer comps. Do the crowds sometimes hang around leading up to these events or afterwards? Thank you. We live in West Michigan and our 2019 spring break is March 29 – April 7. Much of Michigan will have this time off and head to Florida. Just an FYI. I am looking at the March 2019 Crowd Calendar and you say at the end of the month that many schools do not have off this time of the month. Is this locally? How far out, distance wise do you look at schools? And are their school calendars out already? Thanks! Hi, I’m a teacher in Illinois. I know our 2019 schedule already. Most schools in Illinois and a lot of schools in the Midwest do have the last week of March off as a Spring Break, but that might not be the case in the rest of the country. Hope that helps! Here in Alabama some of the public schools have released 2019 calendars with spring break falling March 18-22. Our private schools follow the Easter holiday. We are only a drive away from Disney (7 hours give or take depending on your location) so it’s a popular selection for families around here. Do you think the Star Wars land will be open by July 2019??? No, it will likely open at the end of 2019. The Star Wars Land at Disneyland will likely open around July 2019 though. FYI – I was just there in DW from 1/28 until 2/2… it was NOT lightest crowds. After the park being open for about an hour, many rides were close to or over an hour wait. Of course there was the usual… Mine Train, Flight of Passage, Toy Story Mania & Peter Pan, but others too… Dumbo, Barn Stormer, Soarn’, Test Track, meet and greets with Characters. I have gone at this time of year in the past and never saw crowds like I saw when I was there. Even Living with the Land was 45 mins at one point. That’s crazy. I am now convinced there is no longer “light” days. I miss the days in the “off season” when we could wait 10-15 mins to ride Space Mountain and walk on Star Tours over and over. ;( I just wanted to give feedback on what the crowd calendar said and what was the actual. It was not “Lightest Crowds”. It was more moderate to heavy. Luckily we planned in advanced and had fast passes for what we really wanted, but the perk of going in the off season was being able to have little lines and ride things multiple times. Unfortunately, that is no longer an option at Disney. I still love it, but miss the old off season. Hello, thank you for the helpful information! I’ve looked around a bit but have not noticed a historical crowd calendar. If you have one from 2017, will you please paste a link? Thanks so much!! Disney hasn’t been releasing the hours far ahead of time like they used to. We add the hours as Disney releases them. Not much longer to wait! I love the thoughtful explanations of busy/lighter times. You’ve even got cheerleading/dance competitions! Too many crowd calendars eschew the context. Yours is one of the few we recommend using. My family just booked a trip in November 2018. We hope a resort discount may be offered. Thank you!